He’ll be on the bench or dropped for sat! Both of his goals were quality but the second one is an absolute screamer. I’m sure it will be even better from a decent angle. "He’ll be on the bench or dropped for sat!" One of the things AJ gets criticised for is not changing the team. Scoring a brace on his debut. Bet he's chuffed. Will he wear a poppy though? I would still like to see Faissal and Keena up front. Does anyone know if Hearts have a recall option. With Ikpeazu and Naismith injured and having sold Lafferty, I'm not sure how long he'll be with us. Think the tactic of playing a tall striker with a smaller one is good, especially when we resort to the long high ball into the box. Best of all of course is to have a striker who will score regularly. I'd doubt that they can until the window opens because of the registration rules. If that's the case then he's got an added incentive to perform well. Yeah, pretty sure he could go back to Hearts but not play til January. Since they have a new striker signing then, and Naismith will be back by then, I'd like to think we'll have him til the end of the season. It's not the time for hyperbole, but Aidan Keena is quite clearly the saviour of Dunfermline Athletic. Yes if Keena doesn't win us this league single handedly my flabber will be ghasted. I thought Beadling was going to win us the league ? Ooooft what a strike for the second!!!!!! Beadling is an absolute crock . Waste of a wage at the minute. Supporting the pars is maybe not for you,it clearly upsets you. I was more impressed with his first goal. Showed good composure and quick feet. First was class as well. What a strike for the second one but the first one is very good as well. From his cut inside and his finish into the bottom corner, the lad hardly lifted his head - he knew where the goal was and was off celebrating before it hit the net. Refreshing to see that instead of players having 5 touches and waiting and waiting to have a hit from similar positions. The second one was a belter but he's got so much to do on that first one, he's away before it hits the net aswell, knows he's nailed it. "Will he wear a poppy though?" Does he have an issue with such ? Have no idea, VEE, that was a bizarre comment from AB I thought. Couldn't care less if he doe or doesn't mind you. Personal choice and all that. "Have no idea, VEE, that was a bizarre comment from AB I thought." Seeing as we are diverging off subject. I'm still curious as to why any Pars supporter would name Jock Stein in their dislike list. That is a vile accusation to make about the most influential manager in our club's entire history, when there's not a shred of evidence to back bit up, Wheelie. Harry likes to wind folk up - what's your motive? War on earth is BJKASFA? To get it back on track he know holds the main striker role here. If he keeps scoring it will be tough to move him......unless Hearts recall him. I'm assuming (correct me if I'm wrong) that Hearts have loaned him to us so that he can get some game time. So I think it's a tad premature to worry about the laddie being dragged back to his parent club just because he scored two goals on his first start. If he keeps banging them in... Ye never know... But let's not start worrying yet. As it stands he is at best 6th choice Hearts striker, long way to go afore he gets recalled. I'll imagine he will be here all season if he plays. I thought the loddie looked very sharp and although his second goal was an absolute cracker , his first strike was that of a clinical striker. Really hope we have turned a corner and genuinely believe AJ may have found his best system/team. Possibly a few tweaks in personal but compared to the performance on Saturday , it really was night and day. When was the last time that we scored from 30 yards? Normally we have tried to walk the ball into the net. I’m sure Joe Cardle had a couple from distance out on the left wing last season, one being a beauty against Dumbarton. I also recall Aird had at least one from a similar distance and position last season too. 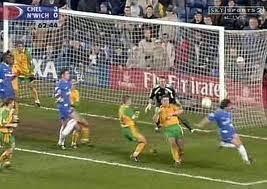 Still, that doesn’t take way from the quality of Keena’s second goal. Sorry to burst everyone's bubble, but here's how things will pan out between now and Saturday. Jim Goodwin and his management team will be all over the highlights of our game v ICT. He will then devise a strategy and tactics to ensure our newly discovered star striker doesn't even get a sniff of a chance v Alloa. This may include an early "reducer" tackle much loved and advocated by Martin Keown, in which the dangerman is on the wrong end of a hefty tackle to reduce his effectiveness for the rest of the game - well worth picking up a yellow card for, apparently. Of course AJ will have worked this out for himself, cos he's the Pars manager and I'm just a fan, so he will advise his players accordingly and set them up to counter Alloa's likely tactics. It'll be interesting to see how it pans out. Then AJ should play him and Fass from the start as Fass usually has two players closing him down anytime he gets the ball. It can only be a bonus if it takes three-four players to keep an eye on those two. Keena scored against Alloa for Queens Park last season, Goodwin has seen him before. Alloa will as they have done in the past stop us playing wide by narrowing the touchlines. We will frustrate ourselves by over running wing play. Predict a lot of throw ins and goal kicks. On the subject of throw-ins, if Alloa are narrowing the pitch, I would like to see Hippo employing some of his long throw-ins into the box. They are likely to be more accurate and threatening than our corners. A goalkick for us is more dangerous than our corners. If Alloa do reduce the width of the pitch , given that we aren't playing any wingers this season ,it will play into our hands ! Sometimes three on Faissal Worst, good thinking. AB Loyal with a lovely "walk in, throw a verbal grenade, walk out" comment there. Really top work by the boy. Back to the original point... Keena is clearly the next Balon d'Or winner. Best I've seen in my life. Long live the King. Alloa reduced their pitch width during the summer, so there are no “ifs” about it. Indeed they did and once set they cannot be changed throughout the season so there's no "narrowing the pitch" as it has already been narrowed! If anything it seems to be working against them as their away form is better than their home form - Falkirk seemed to benefit from the narrow pitch as they have no wingers either (or any footballers at all really). It can't get any narrower-they reduced it by 9m in the summer to meet the minimum requirement. I'd be a bit surprised if Faissal starts to be honest. Wouldn't mind seeing it though! Faissal has had more than enough game time to prove himself this season. Keena and Ryan should be given an extended run now. Agree.There was a Dundee fan on here the other day and even given their predicament they weren't interested in taking Faiss back. Ryan is our player also so we need to decide whether he goes for free at the end of the season or is worth keeping on.He has never had a sustained run in the side and FEB has contributed next to nothing all season-Keena produced more in one game. Can't see AJ changing the attack unless it's forced upon him.He seemed to be more complimentary about our attacking threat the other night and we need some continuity. I have got a feeling we are going to skelp Alloa. And I mean by four, five or six goals. I think we have turned the corner. 6 points in the next two games. Correct. It was a massive mistake bringing him back. Does anyone know if we can cancel the loan in January? I'd much rather we gave Ryan, Keena and Muirhead the chance up front. Muirhead is a carthorse who looks like he couldn’t care less about being here. His attitude is the complete opposite of Faissals. We haven't seen much of Muirhead but he should really have scored that opportunity he got late on, instead of sclaffing it over the bar. The defender who was marking him slipped, so he had plenty of time to size up his shot, but instead rushed it. Not the sign of a striker on his game. I'm not writing off Faiss but he certainly doesn't deserve to be in the team. Two goals on his debut and absolutely nothing since. Keena and Ryan again please. Also probably paying the bulk of Faissal wages. Keena's interview on COWS seems to confirm he can't play in Reserve League games so he's going to have to hold down a place in the first team if he wants to get match practice. I thought we turned that corner a few weeks ago but we bumped into a Dumfries lampost and got a black eye. Lets hope we keep on track this time. I could be wrong but I'm nearly certain we paid a small loan fee for Faissal El Bakhtaoui. Not sure about the wage situation.